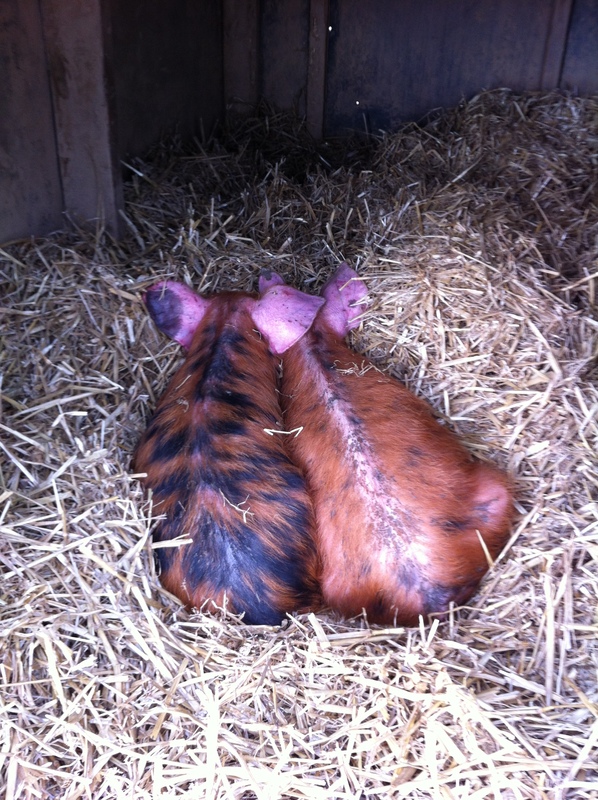 We have kept pigs now for a good few years, buying them in as 8 week old weaned piglets and keeping them until they are between 6 – 8 months old before sending them off for meat. It is very important to us that we know that any meat we eat has come from well cared, well fed and healthy animals – in fact we only eat our home reared meat and I am vegetarian the rest of the time! Above: piggies waiting for breakfast by the gate – the same darlings that caused the ploughing effect in the next photo. Over the years, once people know you rear pigs, you get asked lots of questions. One question that I have been asked on several occasions is “could I keep a pig in the corner of my garden?” Well I suppose the easy answer to that is ‘Yes’ and going back decades and beyond lots of households did do this but would I recommend it ‘No’! The pigs really enjoy having lots of space to run around in and they absolutely love to dig up the ground and find bugs to eat – afterall pigs are omnivores. 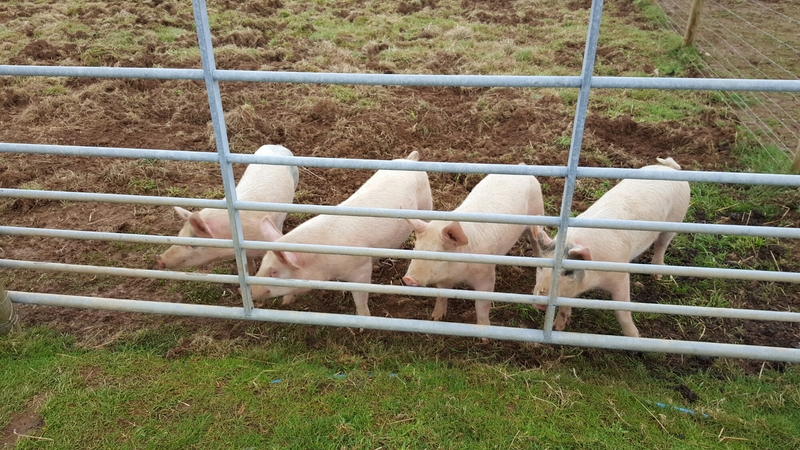 Our pigs are kept in a 1/4 acre paddock that is securely fenced and after each 5 months of use we let the ground rest for at least 5 months before putting pigs back in there – most of the time longer. 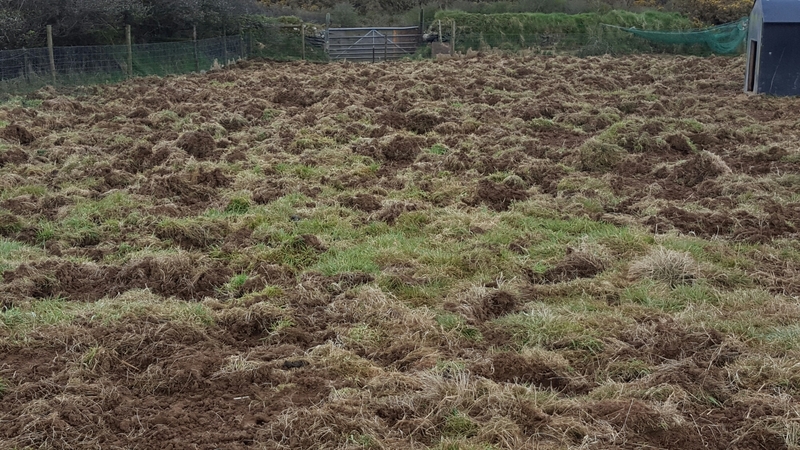 As the photo above demonstrates, pigs love to plough and this is what 4 little piggies do to a large paddock in just a month! Can you imagine this in your back garden never mind the fencing you would need to stop escapes, as they are very good escape artist and I have even seen our metal gate lifted off its hinges! So if you are considering keeping a pig in the corner of a garden take stock and think about the amount of room needed for happy pigs and the key question is do you want a garden at the end of it or a mud bath ! 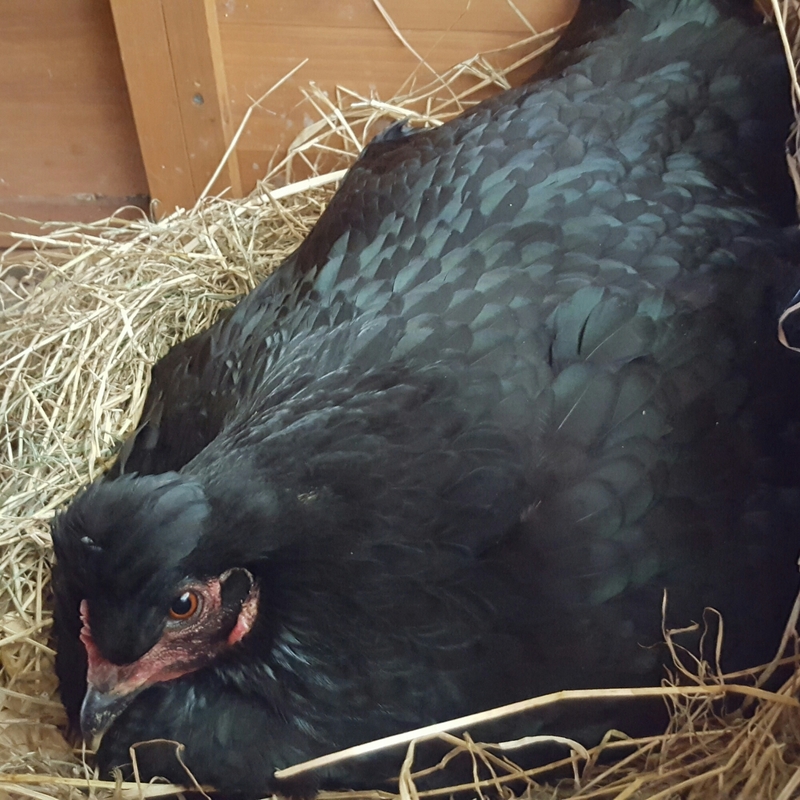 We don’t have a cockerel at the moment so our broody hen could sit on her nest forever and no chicks would appear. However, she seemed determined so I searched locally for some fertile hatching eggs and brought nine. The hatching eggs are from Pekin chickens, two different colours so the chicks when they hatch will be Pekin chickens. I have to admit the idea isn’t my own I saw it on a post on a facebook group but it is a fantastic idea and once I saw it i set about putting ‘gutter berries’ into action! So having used my charm, I now had acquired two lengths of guttering to develop my ‘gutter berry’ proto type for the polytunnel. The first step was to put ends on the guttering so that the soil wouldn’t fall out and this was done by cutting out plastic from old plant pots and glueing them onto the end with a glue gun. 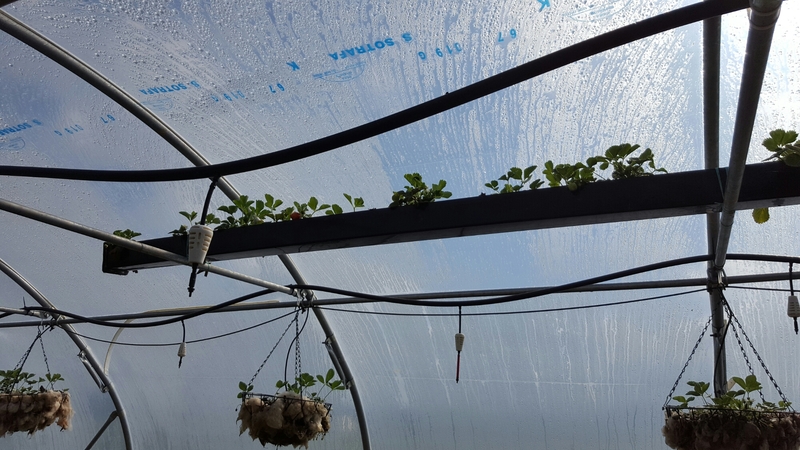 After this the guttering was attached to the roofing struts in the polytunnel and then filled with soil before the strawberries plants got carefully placed along the length of the guttering and bedded in. Lessons to learn for my next gutter would be to fill the gutter with soil and plants before securing to the roofing struts! Let’s just say I got slightly covered in soil the first time. This week I have my first strawberry nearly ready to pick and I am really happy with the results. I am planning to put more guttering up in the polytunnel and have more ‘gutter berries’ in the future. 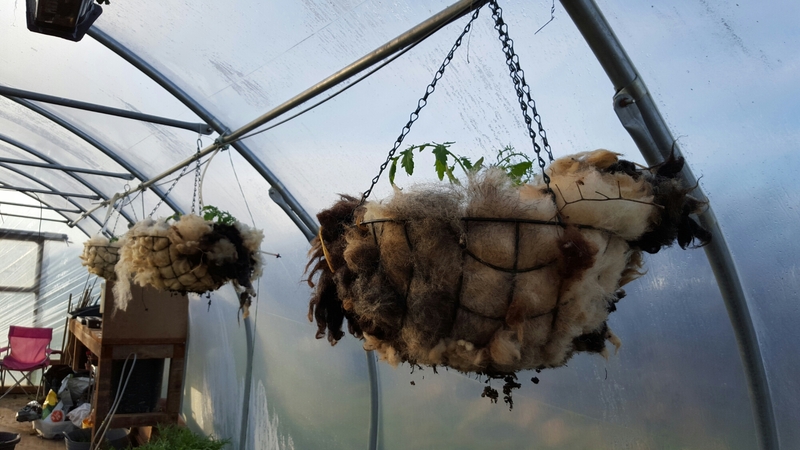 I like to make the most of all the space in the polytunnel to maximise what we can grow so we have been making hanging baskets using sheep’s fleece as linings for the last couple of years. 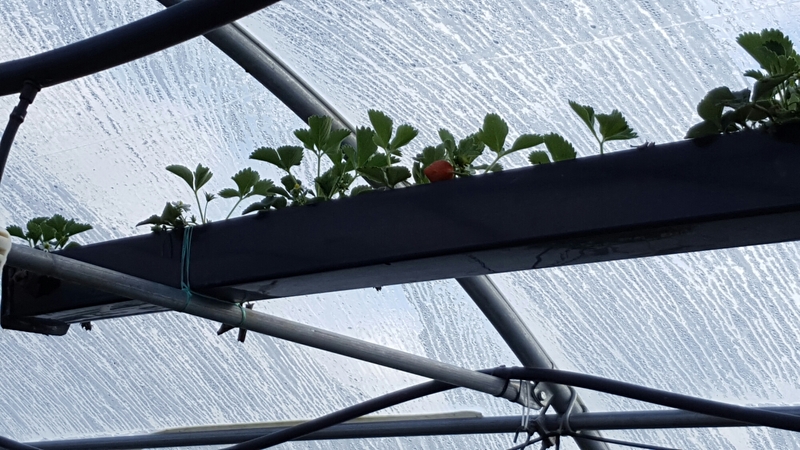 This year I have also put old guttering up in the framework, filled them with soil and planted strawberries – buts that’s another post! The start of the process for the hanging baskets starts with our sheep. 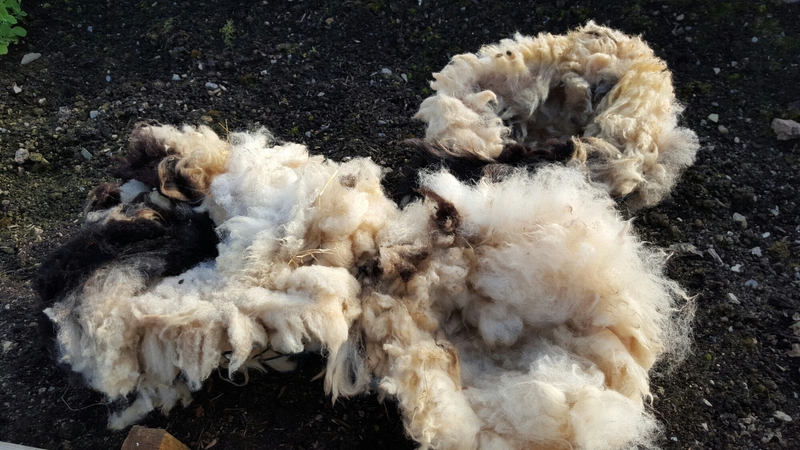 Each year in late spring our small flock of sheep gets sheared so that they aren’t too hot during summer and this also helps prevent fly strike (nasty condition for sheep). 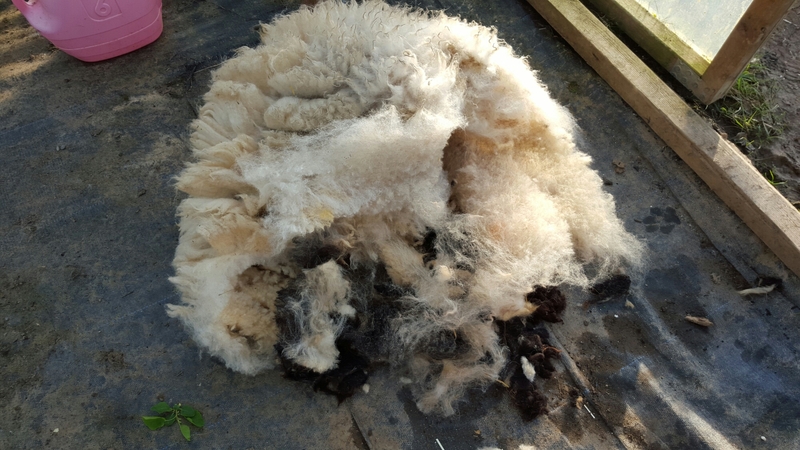 Unfortunately, there isn’t much value in sheep fleece especially when you only have a few cross breed sheep so we like to use it around the smallholding. Some of the cleaner fleece I have used for loom weaving and my plan is once I have practiced a bit I will try and make a rug. 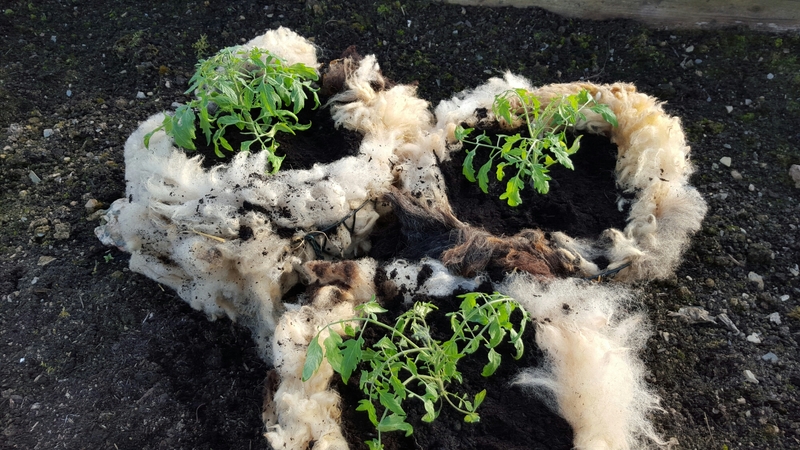 But that still leaves a lot which I make hanging basket linings out of – fleece is very absorbant so is ideal as a liner and holds moisture well. The first stage is to get enough to fill the wire basket frame. 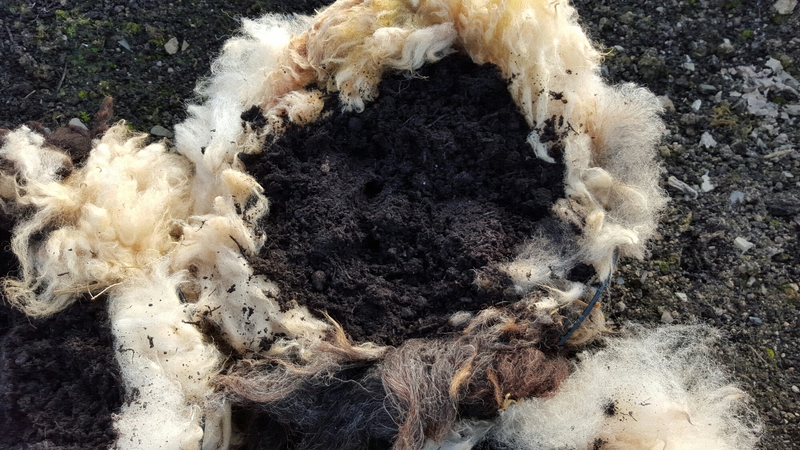 It looks like a lot of fleece but you need enough to make sure that soil can’t get through and once the soil is packed into the linings it compresses quite a bit. Next stage is to start filling each basket up with soil – pushing it into the lining filling all the gaps and getting as much as you can into the basket (the soil will shrink when wet). Once you have the baskets lined and filled them with soil you are ready to start planting. I have chosen to put strawberry plants in some and tumbling tomato plants in others. The idea is that the fruit should hang down the side of the basket so it is readily available to pick. All finished, suitably watered and hanging up in the polytunnel. I’ll keep you updated with some photos as they grow and can’t wait for lots of tasty home grown tomatoes. Life has been pretty hectic over the last couple of years here at Newhaven and our wordpress site has become neglected. After quite a long break we are back online and hope to keep the blog updated with news from the smallholding and future projects. Although the blog hasn’t been updated work hasn’t stopped here and we have lots of news to update you on – we now have a polytunnel, the kitchen garden has been completed and the stables have been renovated and now have a new roof. Poppy our family dog is still as much of a character and despite being a couple of years older shows no signs of loosing her boundless energy. She does however have two new cat brothers – Diamond and Socks who are our resident rat catchers when they aren’t snoozing by the radiator. April has been a very busy month for sheep at Newhaven. We took delivery of our two new Ewe’s (now named Saffron and Shauna) with lambs at foot from South Yeo Farm West and our original sheep, Sandra, Shirley and Sheila have all had lambs – but it hasn’t all been plain sailing! All I can say is that April has been a big learning curve in the world of sheep and that it has been a bit of a emotional roller coaster with lots of highs and one particularly low moment! James had already been on a short lambing course and I have recently attended an intro to sheep keeping course but nothing can really prepare you for the practicalities of things when they happen and you do have to learn by experience. 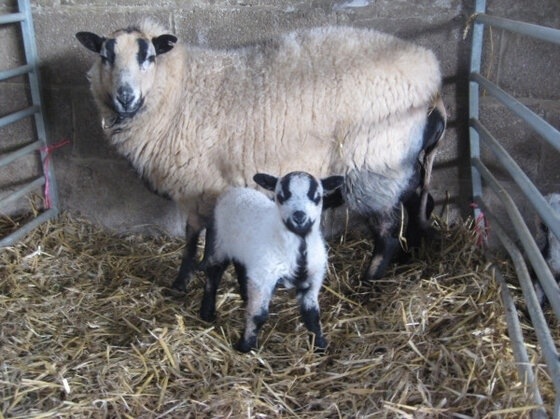 Normally, when your sheep are in lamb you would be aware of a lambing date (give or take a few weeks) but as our sheep’s previous owners had ‘just left the young ram in with them’ we had a lambing window of a couple of months – learning point number 1! So as Sheila, Sandra and Shirley looked like they might lamb we decided to move them into our stable bedded out with straw so that they would be protected from foxes and we could keep a close eye on them. We checked them regularly and waited. What happened next has to be the lowest point since becoming a smallholder, James arrived at the stable to do his turn checking and Sheila was obviously distressed and showed every sign she had lambed. She had in fact lambed but her lamb was dead, she was still calling for it and to hear her so distressed was upsetting. Sheila, had lambed into a water trough (which only had 2 inches of water in it) and the poor little lamb had drowned. James and I felt awful, guilty and upset all in one – we thought we had done everything we could to ensure the sheep has been secure, safe and ready but if only we had put a different water container in there. Hindsight is a great thing and from speaking to local farmers incidents like this do happen. Major learning point number 2! The following hours focused on calls to neighbouring farmers to see if they had an orphaned new born lamb and just when I had given up hope our neighbour appeared with a little lamb that had lost her mum. We rubbed the new lamb with the placenta from Sheila so that she would think that this was her lamb and after a anxious five minutes Sheila and the new lamb had bonded and she was sucking. Learning point number 3! Thankfully, after our first lambing experience being awful, both Shirley and Sandra both lambed without any intervention and we now have 3 healthy Newhaven lambs – two girls and a boy. 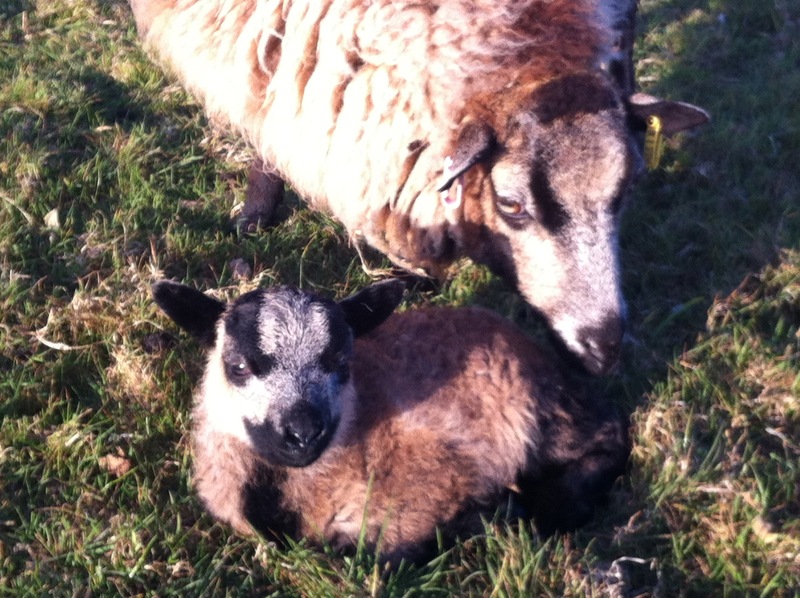 Photo of Sandra the last sheep to lamb and her little boy lamb. We now have 5 adult ewe sheep and 7 lambs in our flock and have learnt so much in the last two months. I really believe that you can do all the research you can, attend courses and read books but it is not until you gain practical experience you learn. We will not forget our first little lamb and hope that by being honest and sharing our experience it may help others. We have been keen to add to our flock of sheep which only numbers three at the moment with Shirley, Sandra and Sheila. The girls we have at the moment are Welsh Mountain Badgerface crosses and we have been really taken by the Badgerface part of them and how pretty they look. So our search began to find a local breeder of Welsh Mountain Badgerface sheep and we didn’t have to look far before finding Debbie and her husband at South Yeo Farm West just over the border into Devon who had a flock of them and had some for sale. We contacted Debbie who was very helpful and said she had some ‘in lamb’ ewe’s available but after chatting through the options we decided that it was going to be too late to move them safely and that it would be best to wait until they had lambed. It was a long month as we excitedly waited for news on the sheep lambing and finally earlier this week all Debbie’s sheep had finished lambing so we could go and visit. I went over to South Yeo West a few days ago to pick out a couple of sheep with lambs at foot and it is a lovely place, with lots of happy animals (well the gander didn’t look to happy to see me but then what do you expect in spring!) and I am very envious of what Debbie and her husband have achieved. Below is a photo of one of the Welsh Mountain Badgerface new mums with her lamb. Don’t they look adorable? So we have two ewe’s arriving next week along with their four lambs and we can’t wait! We need to decide on names for our two new ewe’s so any ideas beginning with S gladly welcome. In other sheep news, we have discovered (its a long story) that Sheila and Sandra are probably both in lamb, and we are not sure about Shirley! As we have only owned them two months we are keeping a careful eye on them for signs as we don’t know when the lambs are due – between now and June! Its all go here isn’t it! James is busy remembering what he got taught on the lambing course and we are keeping a very close eye on them. It has been a week of mixed weather here at Newhaven starting with lovely spring sunshine then we had two days of wild weather with very strong winds and rain. But with daylight hours increasing the chickens and ducks have increased laying and we have had our Muscovy duck, Masie, sitting on a nest of eggs for the last month. 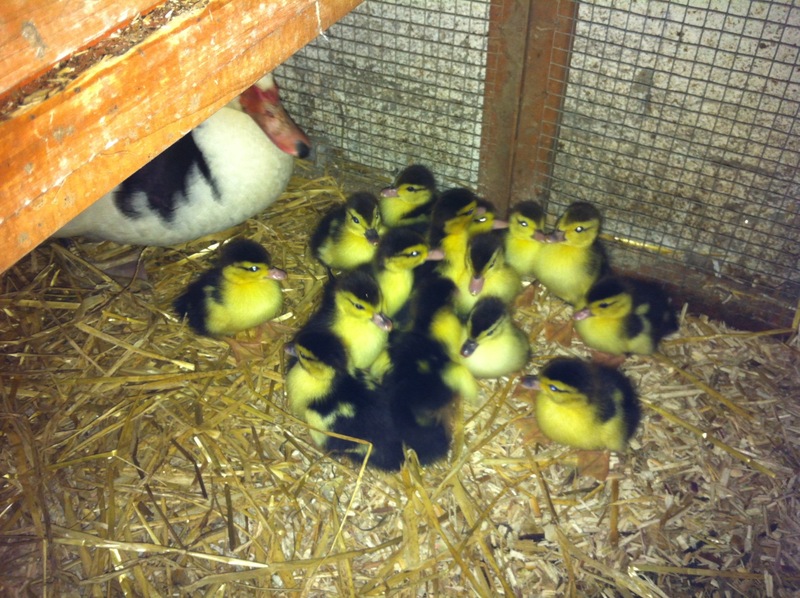 Masie has sat tight on her eggs for the last 35 days and on thursday lots of little ducklings began to hatch. Today I have finally been able to check over the ducklings and see exactly how many she has hatched and I am amazed that she has hatched out every single egg – all 15 of them!!!! Masie has been an excellent mother so far and I still can’t believe she has 15 ducklings but she isn’t the only new mum her at Newhaven. We have just brought a foster hen mum with 13 chicks! 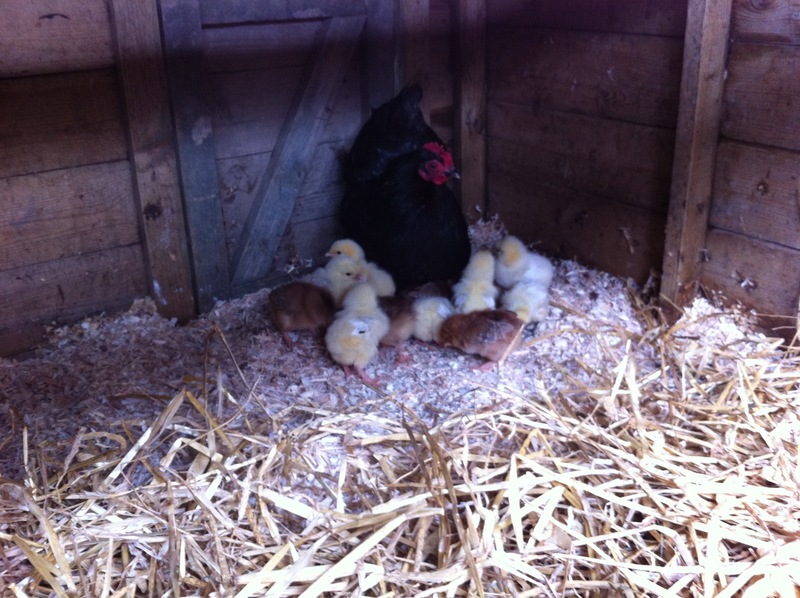 Mum hatched out the eggs but they aren’t her own, chicks should be a mixture of Light Sussex, Welsummer’s and Silkie’s. So spring is definitely in the air at Newhaven even if the weather hasn’t been spring like all the time. We have also been fortunate not to have been hit with snow like a lot of the UK. We were delighted when we heard our friends Steve and Vikki were getting married at the end of September last year. And we were thrilled to be able to share their special day with them especially when James, my husband was asked to be best man. As is tradition at weddings, during the speeches the best man got given a thank you present, something to remember the day by and James present was something a bit different. He got presented with 8 female quail in a huge pet carrier, I do think most guests wandered what on earth was going on and some even questioned what quail were! 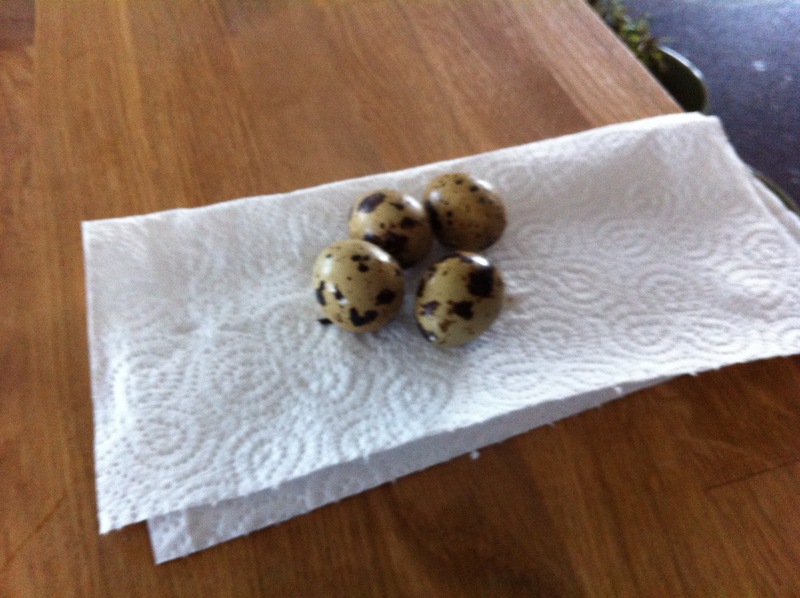 After a few ups and downs leaving us with 5 quails, today is the day that they have finally started laying eggs! I was getting a little worried that we had been doing something wrong (although not quite sure what you can do wrong) and after the rat attack where we lost two quail, I am relieved and very happy to be getting eggs. 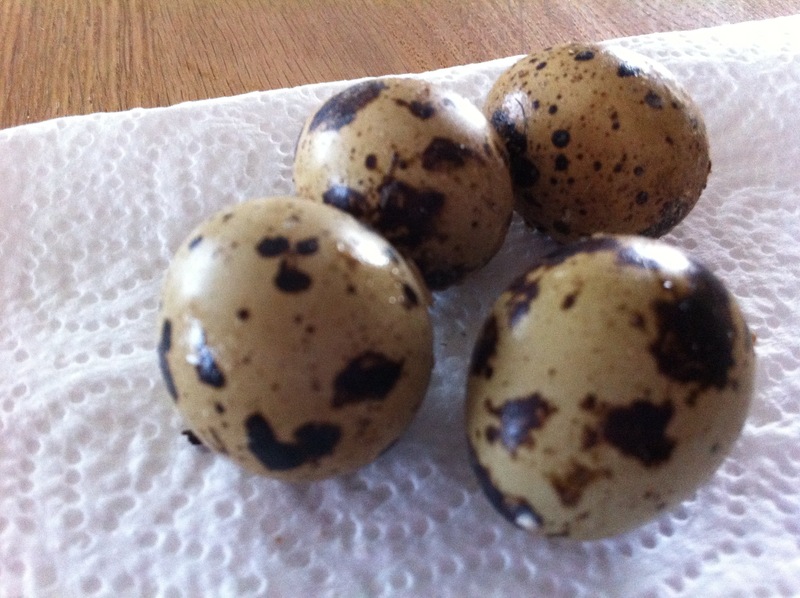 The quail are all now settled in their new enclosure in the new sunnier location so we are looking forward to lots more lovely quail eggs – I have already eaten the ones in the photo!! 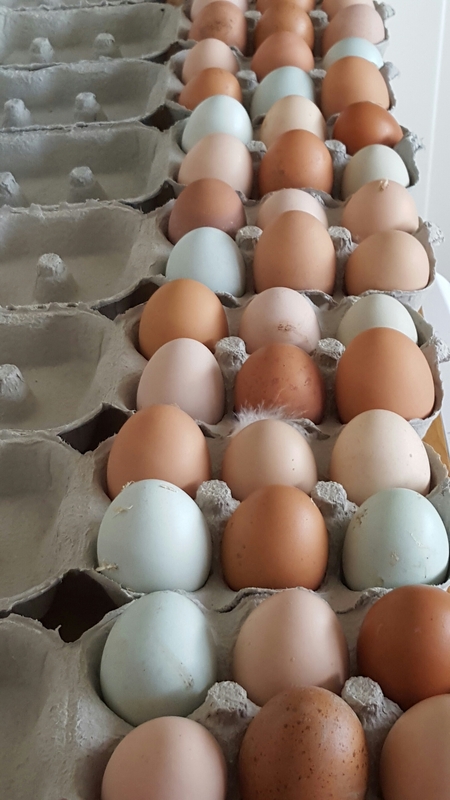 Early this week I was asked by Katy from the “Good Life in Practice” blog to write an article for her blog about how we got into being smallholders and be a guest blogger on her site. Please let me know what you think and if you do think it is a dream or slight madness.